More than 5000 years ago, the ancient Chinese masters of esoteric healing came to the understanding that everything is composed of the same energetic substance, which they called “Qi” (pronounced “chee,” and defined as “breath” or “energy”). These ancient masters observed that there is a oneness and wholeness in all existence and that everything is energetically interconnected as one body through Qi. Fig. 1: From the most ancient to modern Chinese characters for "Qi." The most ancient character for Qi appeared on the Shang Dynasty (1600-1028 B.C.) oracle bones, and on the Zhou Dynasty (1028-221 B.C.) bronze inscriptions as three horizontal lines. According to Chinese medical researchers Zhang Yu Huan and Ken Rose, in their book, A Brief History of Qi, the most ancient Chinese character for Qi originally depicted a “mist that rises from the Earth to form the clouds” (Figure 1). This ideographic form of Qi was retained until the early Western Zhou Dynasty (1066-770 B.C.). The character was also used to indicate heat waves that rise from the heated surface of the Earth and later used to describe exhaled breath that can be seen on a cold day. Traditional Chinese Medicine is primarily based on understanding the transformations of Qi. The ancient Chinese believed that all transformations happened under the influence of Qi, and that within the human body, the Breath (Qi) gathered together to become Essence (Jing). The Essence is then set into motion through heat and vibration and becomes Spirit (Shen). In Daoist Alchemy, disciples are traditionally taught that when the Original Energy (Yuan Qi) is radiant and still, it is called Spirit (Shen); as it flows into movement it is called Breath (Qi); as it coagulates and condenses itself, it is called Essence (Jing). 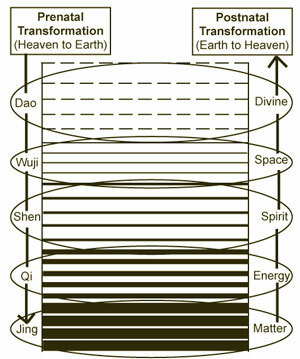 According to the Daodejing, within the entire universe, there is but one Primordial Breath (Yuan Qi). It is from this inexhaustible reservoir, that all things derive their existence. The birth, aging and death of all things within Heaven and Earth, including wind, clouds, thunder, rain, water, mountains, forests, deserts, oceans, humans, animals and insects are caused by and formed out of Qi. Although energy may appear to take on many different forms, all things in nature and, in fact, all things in the universe are intrinsically woven together so that we are, quite literally, all symbiotically one with the universe through the system of Qi. Fig. 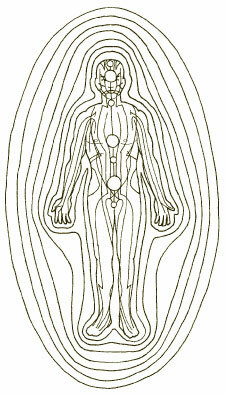 2: The body's Qi radiates from the tissues in order to form the external Wei Qi fields. Qi is vibrating in constant energetic motion within all things. It is the catalyst for everything to relate and interrelate within the universe. The ancient Chinese believed that the Qi of Yin and Yang fills the “Great Void” (Wuji), enveloping all things and leaving nothing outside its boundary. In modern times, the laws of physics have demonstrated that matter and energy are interchangeable and that matter is simply another form of energy. Matter is constantly vibrating in the form of particles or wave forms; it is constantly changing, either affecting or interacting with energy. Energy is inherent in the living human body, and the human body is sustained by energy (Figure 2). Qi is stored within the human body in the form of energetic pools, creating the energetic matrix of the internal organs. From these internal pools, the body’s life-force energy flows in the form of rivers and streams. These special energetic rivers and streams extend throughout the human body, creating its various energetic vessels, channels, and collateral pathways. Fig. 3: The Five Energetic Fields. While the concept of Qi in Chinese Energetic Medicine may seem complicated, it is actually quite simple. Matter progresses to energy, and energy progresses to spirit, and vice-versa. Qi is considered the medium, or bridge, between matter and spirit. • Physically as Matter: At this level, Qi energetically manifests through the physical matrix or sacred geometry (form) of a specific object (e.g., the construction of the body’s cells and tissues). Within the human body, it manifests in the various forms of Essence, Marrow, Blood, and Body Fluid. • Energetically as Resonant Vibrations: At this level, Qi energetically manifests through heat, sound, light, and electromagnetic fields resonating within the physical matrix of a specific object. • Spiritually as Divine Light: At this level, Qi energetically manifests through subtle vibrations which contain “messages” (i.e., thoughts and feelings) resonating within the specific object’s energetic field. Daoist priests teach that these energetic “messages” extend through infinite space (Wuji) to the Dao (Figure 3). Through observation and study, Chinese Qigong (Energy Skill) Masters discovered that each internal organ within the human body has a different function and a different speed of energetic vibration. By tracing the energetic pathways of Qi through each internal organ, and observing its affect on bodily functions, the Chinese developed the basic theories upon which Traditional Chinese Medical practice was founded. For thousands of years, Chinese Medicine has successfully cured serious illnesses by stimulating the body’s Qi in very specific ways. Through the study and practice of Medical Qigong, one can cultivate an awareness of internal energy and its individual pathways, and can learn to influence and even control its subtle energetic power. Medical Qigong Practitioners use these skills to heal and strengthen the immune system, and to improve the function of various organ systems within the body. In the year 2000, China Healthways International estimated that in Beijing alone more than 1.3 million people practiced some form of Qigong every day; and in China as a whole, around 80 million people were practicing some form of Qigong. This article was adapted from The Secret Teachings Of Chinese Energetic Medicine, Volume 1: Energetic Anatomy and Physiology. The International Institute of Medical Qigong Publishing House, 2014. This book is a revised and expanded new edition of Volume 1 of the Chinese Medical Qigong Therapy five volume series. Professor Jerry Alan Johnson is currently the author of twenty-one books and twenty-five DVDS. These and his CDs may be found at www.qigongmedicine.com.